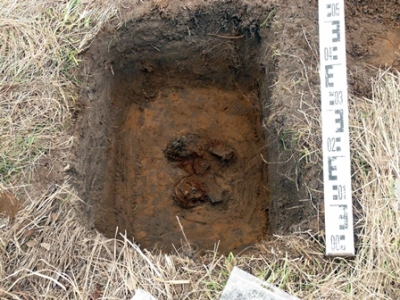 At the end of March a local heritage-interested man Peeter Kiuru, who had previously conducted the heritage culture project in Alatskivi municipality, found a new archaeological site in Kodavere parish. It is a fine example of responsible metal detecting in Estonia. The newly discovered site is presumably a burial site at the old shore of Lake Peipsi, which is now some kilometres away the current shore located next to a small relic lake. The site was found on the top of a sandy hill. As a 16th century coin indicates, found at the same location, there used to be a farm already before the 19th century. On the other side of the relic lake there is a harbour site probably from the Viking Age or even earlier, which also had connection with Lake Peipsi. Such harbours are very often indicated by burial sites in their vicinity. Just like in this case, there is another burial place on the other side of the harbour, which was excavated in the 1970s, dated back to Roman and Middle Iron Age (2nd – 6th century). But the newly discovered site seems to be from the 11th century. So far about 50 items were found at this new site, which is typical to the burial places of the area. As the upper layers of the hill were removed in the course of land reclamation, the items are scattered around the hill, but there is a little hope that some parts of the burial site have been preserved in its original position. Since only few pieces of bones were found in the site yet, it is also possible that the area is not a burial site, but a site of ritual sacrifice of iron and bronze items. Such places can often be found in the vicinity of ancient harbours as well. However, the exact function of the place is not certain yet, experts hope to reveal more during the trial excavations in May. It is very likely, though, that the site is part of a landing complex on the ancient shore of Lake Peipsi.